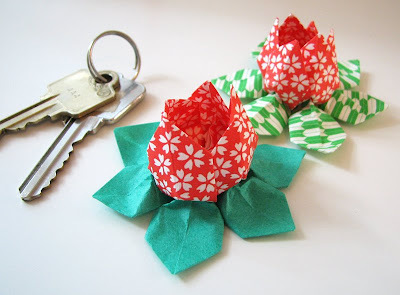 I made little origami lotus flowers the other day. They're quick and cute! Here's a good video with instructions. This is all you need to make them. Have fun. how cute! i'm planning a day of creative fun with my kids tomorrow, and this is now on my list of things to try. thanks! I love these! They're so adorably cute. I may have to consider making them for the centerpieces for my wedding! Thanks for sharing! My grandma used to make them for the temple! It gets a little fidgety but it looks better if there are two layers of petals. great job:) I love it! I make cute hair pins with these, they're adorable. that is so neat! I'll give it a shot. How pretty! You could put a little electric tealight inside each one and have lovely decorations for a party! I haven't done origami since last year when I made a globe out of origami flowers. Thanks again for your answers and photos etc. The magazine isn't available online but once I get it, I'll be scanning it for my blog so I'll let you know when. these are so cute, I love the mix of patterns. thanks for posting the link to the video -- you've inspired me to give it a try! 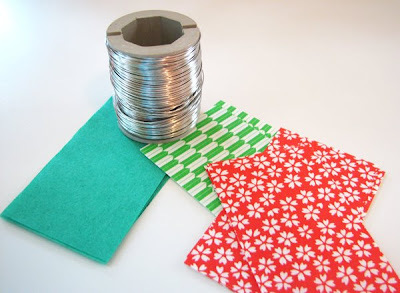 We included this on our weekly DIY Blog "Link Love" Roundup. Cute! Thanks for providing inspiration and fun! This is just super cute!